All right, let’s address the 500-ton jumbo jet in the room: I am an Air Traffic Controller Airport Hero Hawaii is a long and silly name. Although IAAATC is actually an established series in Japan, it’s not the kind of title that tends to inspire great confidence in the West. 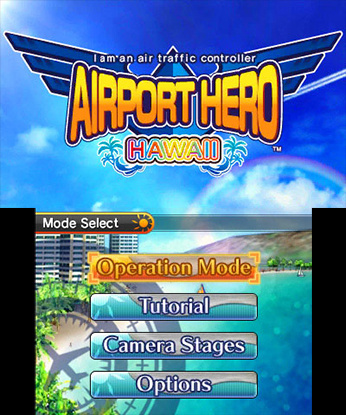 That’s too bad, in a way, as Airport Hero Hawaii reveals itself to be a very straight-laced simulation with play. Whether it will fly well with players? That depends. Airport Hero Hawaii has players managing inbound and outbound flights at a faithful recreation of real-life Honolulu International Airport, including its four runways, two aquatic takeoff/landing zones, and a strangely placed golf course in the midst of it all. Planes are directed over five different radio channels depending on their current status (Approach, Tower, Ground, Delivery, and Departure). Tapping an order for a plane issues over the appropriate channel, with the pilot relaying an acknowledgement; transmissions take place in real time and full audio, although the voices read off a bit mechanically. Taking care of flights appropriately score points, contributing to a goal amount you’ll need within a certain time limit to clear a stage. 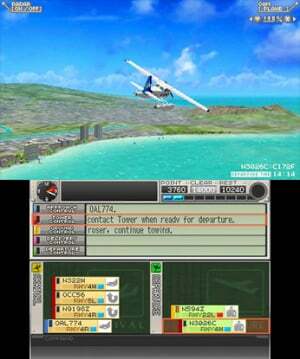 Certain distasteful actions such as making passengers wait too long or making a plane take off against an unfavourable wind will dock points from your total, while making planes bump on the ground or nearly collide in the air results in an instant Game Over (tactfully, the planes never crash). There are 12 stages shown at the start with a few extra to be unlocked, and new stages can also be generated by taking photos with the 3DS camera. The setup doesn’t seem too difficult at first, especially in the snoozer tutorial that guides you through the arrival and departure of one plane. Planes on arrival stay in the air a long time before they approach the runways, while planes that are departing need a lot of time to be cleared and taxi. You will experience every exciting second of each in the full game’s tutorials, which is odd since the demo even seemed to realize parts were dull and fast-forwarded through them. Get more than one bird, though, and the thumb-twiddling quickly vanishes. The board on the touch screen for managing flight information has room for five arrivals and five departures, and the main game will steadily fill these up as you progress through the stages. As traffic builds at and above the airport, concentration and timing become ever more important. You may soon find yourself frantically tapping between all the flights on your board, making sure you didn’t just give one plane a route to its parking spot that will run over the ground crew trying to tow another plane to another spot, all while praying the wind speed will change so you can get another plane off the ground to clear that strip for the arriving plane you promised it to, except you can’t reach either at the moment because the channels are currently occupied with orders to other planes and NO, SHUT UP FLIGHT OAL013 YOU DO NOT HAVE CLEARANCE TO CROSS THE RUNWAY ON ACCOUNT OF YOUR BIG BROTHER CURRENTLY CAREENING DOWN IT IN YOUR DIRECTION CAN’T YOU SEE THAT?!?! The stages become challenging quickly, and are puzzle-like in the way you need to manage your time and order of commands. Frankly, it can become quite draining. One stage can take upwards of 30 minutes to complete, and if you make a mistake and get two planes too close to each other you have to start all over from the beginning, even if you were right at the end. There are no checkpoints, no way to accelerate time through the points you have down to get to the ones you don’t, and no way to rescind some of your orders. Woe unto you if you were stupid enough to order a plane to park in an already occupied spot, as you have doomed yourself and all the time you have invested to that point. The game’s presentation does help provide the info you’ll need, however. Your information board is nicely organized and readable at a glance. 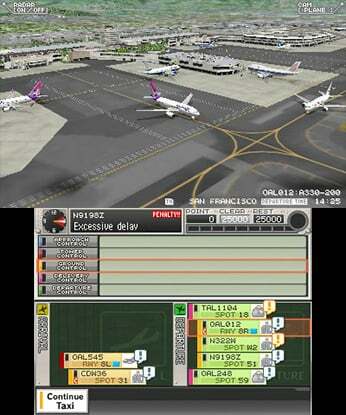 You can also switch between several different views to monitor the planes, although the top-down view is a bit too zoomed out, even for a 3DS XL. Highlighting the current path of a plane on the ground when you select it would have also been helpful, as you have to memorize it after you choose. There's a surprisingly varied selection of music for each stage, ranging from light and tropical to a bit more bouncy and invigorating. Thankfully, the cringeworthy text in the demo has been mostly cleaned up and is very much readable, although there are still a few stray uncapitalised letters and your crash warning screen will light up with “ARERT!” Oh dear. I am an Air Traffic Controller Airport Hero Hawaii is a tough game to judge. Beneath its oddly worded wrapper lies a sim that was obviously crafted with care toward the details of the job. It’s this strict adherence to the details and calls for perfection, however, that make it difficult to recommend to everyone, especially at a relatively high launch price point. Big aviation fans, and/or those who want a demanding challenge and have the patience to endure starting from square one, may find blue skies here and should definitely try the demo. I was just playing air traffic chaos this morning ...... great little puzzle game, might get this. No check points or any way to speed time up ..... you cant do that in a real ATC tower .... one mistake and people die!!! Love this series! Loved the DS and PSP versions, got super addicted to the main series on PC. Please come to EU/AU shops! I'm a fan of airport games (I even released one on DSiWare - Airport Mania . Price is high on this, but I'm interested! Not for me, but after playing the demo I definitely appreciate all the work that went into the title. A great piece of simulation-ware. Not the kind of game I tend to like, but the title is AWESOME. People take gaming way too seriously sometimes. As for long levels with no checkpoints. Bit.Trip Beat comes to mind here (though you can make more mistakes but it is the same frustration of getting halfway through to lose at a certain point and have to start again). I was only able to see that game trough to the end thanks to the Easy mode (present in the Steam and retail release). @6ch6ris6 Not sure if you are thinking cheap or expensive but the Japanese retail release was over $50. I'm keeping away from this game simply because of the name... it just screams stupidity, also this game looks absolutely boring as hell. Man, this game is fun, but there isn't a way to be able to see every plane's position at the airport, which is a problem. I've Game Over-ed a couple times on the Hard demo stage because planes would be in places I didn't want them too, but I couldn't see that until that stupid plane that needs to be towed to spot 61 would collide with them. I think I met someone who was addicted to this game on Just Cause 2 Multiplayer the other night. He was issuing tower commands to the many aircraft buzzing over a tiny island. It was actually pretty interesting to watch especially since it all took place in chat. He was good at it, too. "tactfully, the planes never crash"
Oh god, I almost thought that was another "I am in" installment from last week. That game would have been so much better with more content, more memory, ability to upload it, and have it be on the much faster and handsome 3DS rather than having it be DSiWare. 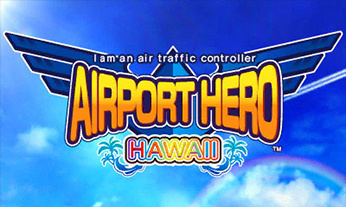 Why not just call it Airport Hero: Hawaii. It's much more simpler and will help prevent confusion. I had a dream last night in which I bought this game and was thoroughly disappointed. The DS game was fun. This game demo was not. And the Engrish sprinkled throughout was distracting. I am not going to spend $20 for a game that couldn't get the language correct. Seriously, when the 'Red Arert' popped up, that guaranteed I would pass on this title. I want this...I need this. How about an EU release then please? ?